Beyond Ultraglass B3 Template Thruster Set to fit FCS plugs & boxes. Beyond® B3 Ultraglass Thruster Set with a precision foil in multiple layers of a quality, pure fibreglass – to fit FCS plugs & boxes. Engineered to exacting standards for tunable flex surfboards to provide a variable stiffness fin for drive and transition through a wide range of manoeuvres. A medium/small area fin for all waves up to 6′, and where faces or waves demand a looser, freer surfing style. Also in Flexcore and Carboncore styles, and a Futures Base. Try B5′s for more area giving drive and hold, or the B7’s in larger surf or hollow waves for connection and drive you can rely on. 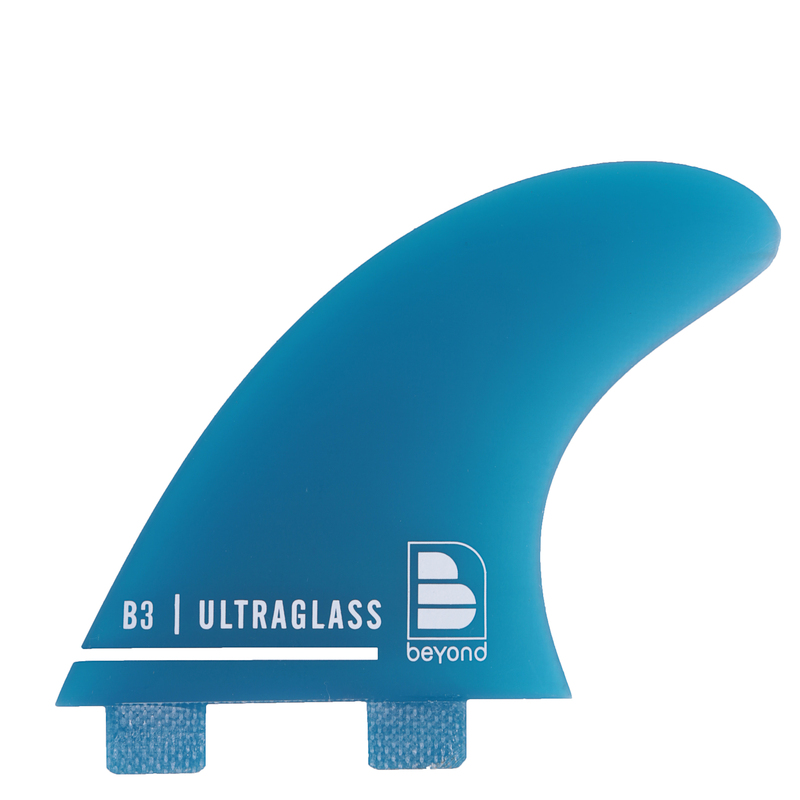 Beyond® Ultraglass fins are designed to provide better high flex patterns from tip to base for extreme surfing situations. Fully multi-layered fibreglass fins shown in all their glory (no covering of flaws and shortcomings) provide feel and zap and are still the choice of many surfers. Utterly pure quality…..
Beyond® B3 Ultraglass Thruster Set with a precision foil in multiple layers of a total quality, pure fibreglass – to fit FCS plugs & boxes. Engineered to exacting standards for tunable flex surfboards to provide a variable stiffness fin for drive and transition through a wide range of manoeuvres. A medium/small area fin for all waves up to 6′, and where faces or waves demand a looser, freer surfing style. Try B5’s for more area giving drive and hold, or the B7’s in larger surf or hollow waves for connection and drive you can rely on. Beyond Ultraglass fins are designed to provide better high flex patterns from tip to base for extreme surfing situations. Fully fibreglass fins provide feel and zap and are still the choice of many surfers. 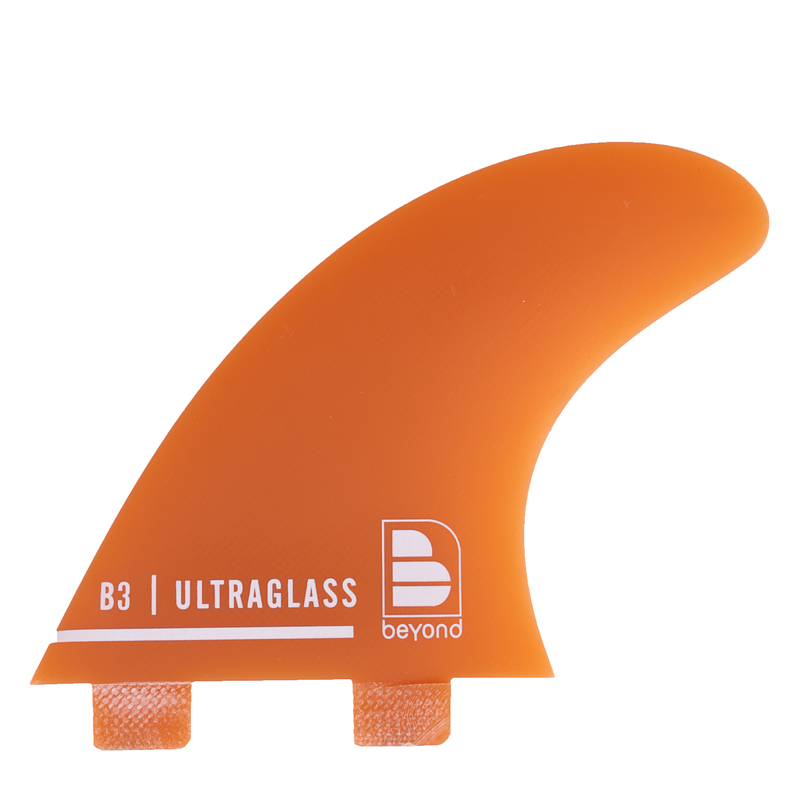 For a different flex and drive pattern try the Beyond Carboncore fin range, or the Flexcore range of hex glass fins. Comes complete with a zipped protective storage pack.